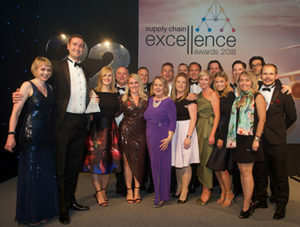 Winning Supply Chain Excellence Awards left industry professionals “inspired”, “surprised” and “blown away” at the Hilton Park Lane on Tuesday night. Jakub Osiewacz and Amjad Chaudry from Shell said they were “blow away” by the ceremony. “Fantastic fun. I’m inspired by everything I’ve seen around me – I’ve really enjoyed it. I’m just so inspired by examples of fantastic professionalism this year around,” said Emma Dempsey, chief operating officer at Clipper who won with Superdry. The Supply Chain Excellence Awards evening is a chance for businesses to gain recognition for their industry input and inspire and support others. Daniel Streeton from Greene King agreed: “it’s been an excellent night and great to be recognised for such a great team effort.” Greene King with Kuehne + Nagel won the Logistics Innovation Award. Likewise, XPO finance business partner Claire Leadbetter said: “it’s been wonderful, this is the best award we could have won out of all the awards.” Ted Baker with XPO logistics won the Team of the Year Award.